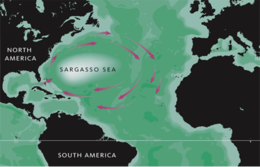 The Sargasso Sea is a region in the gyre in the middle o the North Atlantic Ocean. It is boondit on the wast bi the Gulf Stream; on the north, bi the North Atlantic Current; on the east, bi the Canary Current; an on the sooth, bi the North Atlantic Equatorial Current. This seestem o ocean currents forms the North Atlantic Gyre. Aw the currents deposit the marine plants an refuse thay carry intae this sea. This page wis last eeditit on 15 November 2014, at 15:18.